Our 42nd annual winter destination event will take place January 12-19, 2017. The deadline for entries and deposits is September 1, 2016. January 12: Arrive on the Big Island of Hawaii and the Mauna Lani Bay Hotel andBungalows, our home for the week. Festivities start with a seaside Opening Reception at 6:30 PM. January 13: A quick breakfast this morning to discuss the week’s schedule and you are free the rest of the day to enjoy all the Big Island has to offer. January 14: Round 1 of the pro-am on the very popular South Course. Tee times today start at 9:00so we can take your team photos! The 7th and 15th are two spectacular par 3’s right on the water. January 15: Free day for practice, leisure, or enjoying the island. January 16: Round 2 of the pro-am on the challenging North Course. Today is an 8:00 Shotgun so you have the afternoon free. 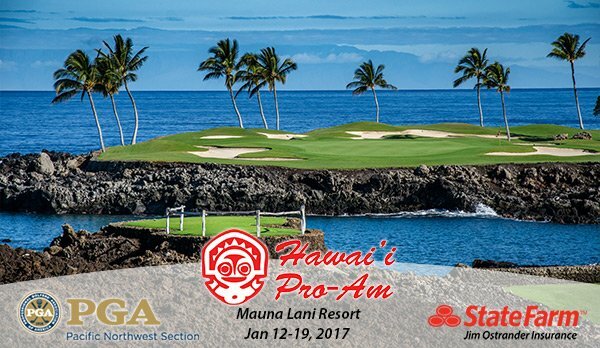 January 17: Final Round of the pro-am back on the South Course. Another 8:00 Shotgun. The Ladies’ Tournament will be played today in the same South Course shotgun— be sure to sign up! January 18: Farewell Cocktails and Awards Dinner tonight at 7:00PM. January 19: Departures. Not ready for your stay in paradise to come to an end? Trip extensions are available. The entry form is for your team deposit of $200 per person to hold your spot. Submit this form and we’ll reply with the complete entry form to confirm arrival and departure dates, room upgrades, and a few other important details. We are happy to announce that Jim Ostrander Insurance is back as a sponsor for this event. We’d love to see you in Hawai’i! Contact Molly or Jeff at the PNW PGA Section Office at 800-688-4653 for details on this exciting event!